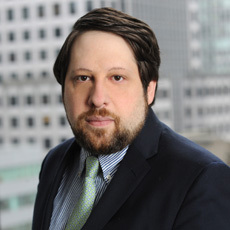 Home > Attorneys > Marcus, Jonathan J.
Jonathan J. Marcus joined Becker Glynn as an Associate in 2016 and is a member of the firm’s litigation group. His practice involves a wide variety of commercial disputes, including intellectual property disputes and asset valuations. Mr. Marcus has a special interest in matters involving complex damages and those related to technology and communications. He has experience litigating cases involving pharmaceuticals, telecommunications, and corporate transactions. Mr. Marcus has extensive trial experience, as well as a deep commitment to resolving client issues in an efficient and effective manner through sensible dispute resolution. In addition to his work as a litigator, Mr. Marcus is an associate member of the board of Volunteer Lawyers for the Arts and commits several hours each month to consulting with artists and non-profit organizations to provide both practical and legal advice about their respective endeavors. His commitment to pro bono work is notable: he has twice been commended by the Legal Aid Society for employment litigation.